This is the repair log for Elaina, the 1991 Alfa Romeo Spider I owned from September 2003-July 2009. Not once did she leave me stranded. All problems were relatively minor. 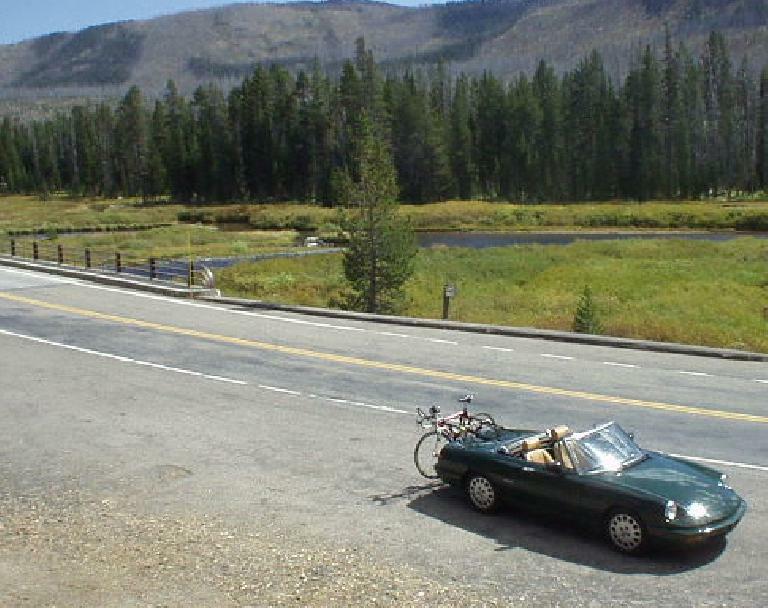 Aug 31’03 Sun: I drive my faithful MGB on a roasting day to Manteca to check out this “forest green” 1991 Alfa Romeo Spider. She becomes the leading candidate for my next car. Sep 1’03 Mon: Paulette A., the previous owner of the car, agrees to sell her to me. Sep 3’03 Wed: Paulette takes the Alfa in for a smog test, which it easily passes. Mileage: 42,385. 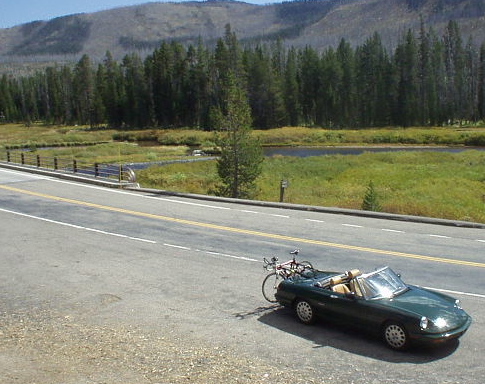 Sep 4’03 Thu: Paulette graciously picks me up in Fremont, and I drive back the Alfa back to her new home with just 42,400 miles on the odometer. What a joy to drive. Sep 5’03 Fri: I get the radio working, which the previous owner never could since it required a code. Sep 6’03 Sat: On just our 2nd drive out, my little Alfa already gets “date duty,” taking my new sweetie out for a mini-tour of Stanford, dinner, and a Stanford-San Jose football game. 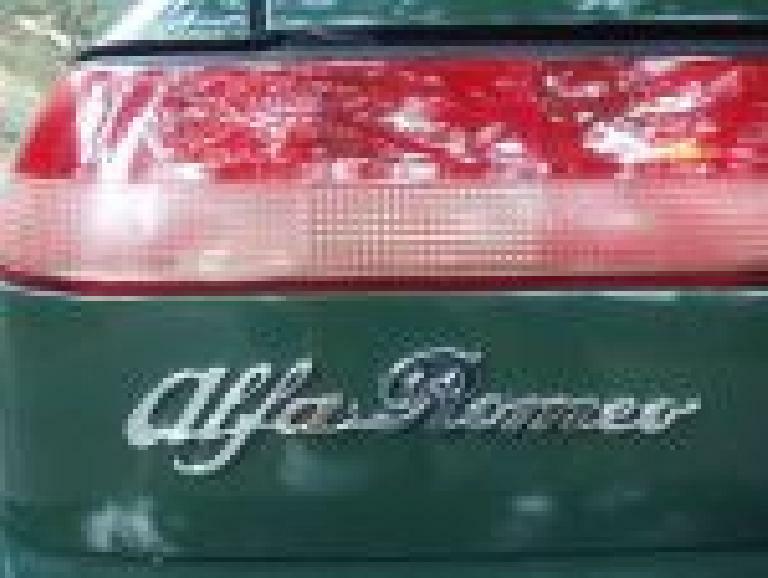 Sep 12’03 Fri: Pulling an all-nighter, I wash Elaina, detail her trunklid, and install a missing Alfa Romeo emblem on the rear. Also, a new “tribal” chrome license plate holder. And most importantly, I rid the left door of a rattle caused by the window glass hitting against a metal power window guide, which its felt liner fell out of. I just glued the felt liner back in and reassembled the door. Sep 14’03 Sat: Unfortunately I am not successful at getting the tachometer working nor deducing what exactly is wrong. Sep 22’03 Mon: I install a new center wheel emblem that was missing but cost just $5 from International Auto. Sep 23’03 Tue: I aim the headlamp… now the left headlamp no longer aims several feet higher than the right. Sep 28’03 Sun: I recalibrate the fuel gauge and now it completely reads accurately. Oct 1’03 Wed: I fix the courtesy lights. All I needed to do was replace the courtesy light timer relay and add in a door stopper that would depress the courtesy light switch on the left door bulkhead. Oct 1’03 Wed: I also replace the windshield wipers which were badly cracked and streaking. Oct 19’03 Sun: I finish polishing and waxing Elaina’s exterior. Thanks to Mike Jacobsen for lending me his orbital buffer, which worked great. Oct 30’03 Thu: Rain-X windshield and window treatment. Feb 3’04 Tue: New battery from Kragen, after killing the battery by leaving on the CD changer a few times and subsequently overcharging the battery. Mar 30’04 Tue: Oil change, and replaced OEM drain plug with magnetic one (27mm hex flat). Odometer: 45,850. Jul 2’04 Fri: I replace Elaina’s stock AM/FM cassette player with a Pioneer MP3 receiver. It’s great: a CD can hold several hundred songs, plus songs can be filed in their own folders (e.g., country, pop, jazz, etc… anything you want. Jul 2’04 Fri: I also fix Elaina’s passenger door handle, which had a tendency to stick open after someone would open the door. Jun 3’05 Fri: Oil and filter change. Odometer: 54,540. Oct 27’05 Thu: Fix driver’s side power window. Odometer: 70,350. Oct 31’05 Mon: Oil and filter change. Odometer: 70,400. Dec 18’05 Sun: Rebuild clutch master cylinder. Clutch is nice and firm now. Dec 20’05 Mon: Replaced the spark plugs with OEM “4-electrode” plugs. Elaina passes smog with no problem so we can now get CO plates. Feb 2’06 Tue: Fix driver’s side power window (again) and door lock. Hot glue bezel of car radio so it rattles less. Adjust glove compartment door switch so the its light stays off when the glove compartment is closed. Sep 2’06 Sat: Reattach left lower valence panel with Silicone. Sep 19’06 Tue: Oil change at Rocky Mountain Quick Lube. Mileage: 79,610. Nov 6’06 Tue: Install new oil pan. May 29’07 Tue: Oil change at Rocky Mountain Quick Lube. Mileage: 83,303. Jul 9’07 Mon: Replace left headlight with CarQuest H6024 (which is Wagner H6024, exactly the same as the old one). Mileage: 84,285. Jul 16’07 Mon: Free brake inspection at Just Brakes in Fort Collins. They reported the brakes still have >50% life on them. Jul 27’07 Thu: Fix all of the side dings around the car (right door, right rear quarter panel, and left door) via paintless dent repair method, by Dent Masters. Could not completely remove the door ding in front of the right side mirror, but an improvement. Jan 20’08 Sun: In a 20 degree garage, I flush/bleed the clutch line, tighten the oil pan bolts, top off the oil, and replace the rear muffler. Unfortunately, the power antenna stopped retracting a few days ago. Apr 12’08 Sat: Lube, oil, and filter change at Rocky Mountain Auto & Performance. Mileage: 87,882. Aug 16’08 Sat: Replaced lower oil pan gasket, using gasket remover, high-tack gasket sealant, and torquing the bolts with a torque wrench to 7.5 ft-lbs. New oil. Mileage: 88,900. Jan 16’09 Fri: Bled clutch, as clutch slave cylinder is leaking. Also retorqued oil pan bolts. Mileage: ~90,380. Apr 16’09 Thu: Fix power antenna and adjust handbrake switch. Mileage: <91,000. Apr 29’09 Wed: Replace clutch slave cylinder. Mileage: <91,000. Jul 31’09 Fri: Sold the car to Dave B. of Denver for $2500 less than I paid for it. Mileage: ~91,900. You get out a lot easier than I did wiith my 74 GTV. Alfas are addictive and I currently looking for another Spider. Had a 64 Spider but like a fool I sold it for about $2000. I’ve been looking for the courtesy timer you fixed in 2003. Where did you find it? IAP doesn’t have them and I’ve spent several hours on the Web looking with no luck. Also, I’ve poured over the Workshop Manual and can’t find the location of it in the car. I have a 93 Spider(red) named Sophia. Just started restoration a couple of months ago. Have found some good stuff on Ebay…some junk too. I actually found my car on Craigs list.